Former MLB pitcher Philip Humber turns 33 today. Happy birthday, Phil. Despite winning only 16 games in eight seasons, Philip Humber, who happens to turn 33 today, will be remembered for throwing the 21st perfect game in Major League history. He accomplished that feat for the Chicago White Sox on April 21, 2012, beating the Seattle Mariners 4-0. 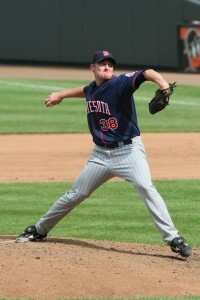 Humber threw 96 pitches over nine innings and struck out nine, according to Baseball-Reference.com. Before that, though, Humber was once a highly touted prospect out of Rice University, who later became a footnote in a trade with the Twins for former Cy Young award winner Johan Santana. Phil Humber with the Twins. Humber was all that and more at Rice University, finishing his pitching career for the Owls with a record of 35-8 and a 2.80 ERA. He also struck out 422 batters in 354 innings pitched. Those heady numbers made him the target of the New York Mets who selected him 3rd overall in the 2004 amateur draft. But professional sports are filled with the stories of talented athletes who never become stars at the next level. That applied to Humber who appeared in five games for the Mets over two seasons. The Twins, meanwhile, knowing that they will be outbid for Johan Santana’s talents in the free-agent market, decide to trade him to the Mets for four players: Humber, Carlos Gomez, Deolis Guerra and Kevin Mulvey. How did that deal work out for the Twins? Not so well. The incredibly fast Gomez is the only player to amount to anything, but he now plays for the Milwaukee Brewers. Gomez likely will be best remembered in Minnesota for scoring the winning run against the Detroit Tigers in Game 163 of the 2009 season. The Twins and Tigers were tied after 162 games played, which required that they play one more. Sports Illustrated voted it the best regular-season game of the decade. Humber was on that 2009 team as well, but it would be his last with the Twins. In two seasons, he appeared in 13 games, but didn’t figure in any wins or losses. His ERA with the Twins was 6.10. Humber’s Major League totals: a win-loss record of 16-23, a 5.31 ERA, one complete game (the perfect game) and 371 innings pitched for the Mets, Twins, Royals, White Sox and Astros.